Shapes is a combo platter of effects. We started with 16 smoothly interpolated wavetables that can be scanned from audio input. Then we added nine waveshaping algorithms, and made it true stereo for good measure. Shapes will, well, shape any source, from a simple sine or triangle oscillator on up to full stereo program material, in to a motherload of new sounds. 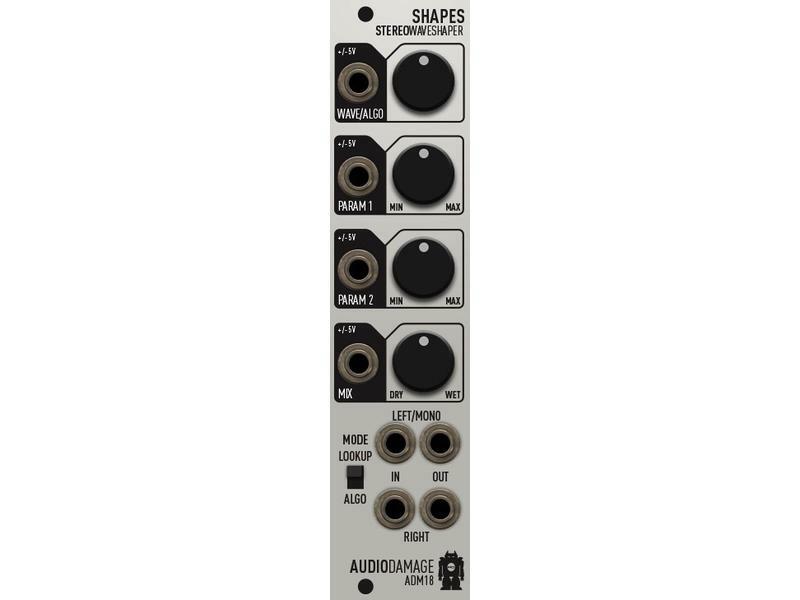 From turning a sine in to a simple square or saw on up to full Nine Inch Nails / Merzbow level destruction, Shapes adds hugely to the sonic palette of your Eurorack modular synthesizer. • The WAVE/ALGO knob and CV input control which wave or algorithm is active. In LOOKUP mode, the knob controls which of sixteen tables the input will scan. In ALGO mode, the knob controls which of nine algorithms will affect the input. 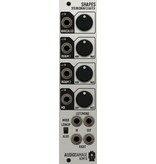 • The PARAM 2 knob, in LOOKUP mode, controls the start position of the table. It can effectively be thought of as a phase control. In ALGO mode, its function varies, and it is not used in every algorithm. • The MIX knob controls an equal power wet/dry mix. At full anti-clockwise, you only hear the input, and at full clockwise you only hear the effect. • The MODE switch controls whether the module acts as a wavetable scanner or a waveshaper. In LOOKUP mode, the wavetables are active, while in ALGO mode, the algorithms are active. • Shapes is true stereo; the left and right signals do not intermingle internally; thus you can, for instance, run a kick in the left channel and a snare in the right, and vary the effect by attenuating either channel before it enters the module. • 48kHz 24 bit audio path with a high-quality Cirrus-Logic AD/DA convertor. 10Vpp CV control over all parameters. • USB port (on the PCB board) for easy firmware updates.